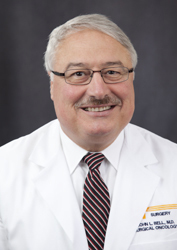 John Bell, MD, Professor of Surgery, was named a 2014 Health Care Hero by the Greater Knoxville Business Journal for his community outreach efforts to take mammogram screenings "to the streets." When Dr. Bell arrived at The University of Tennessee Medical Center 34 years ago, he recognized that there was a gap in cancer education, awareness and prevention in East Tennessee. He and Chaplain George Doebler collaborated to address the community need for education on early detection and prevention of cancer that later would lead to outreach cancer screening programs. Since then, Dr. Bell's vision has led to a fully staffed Breast Health Outreach Program (BHOP) to include a mobile mammography unit that travels to over 21 counties six days a week in East Tennessee. Other cancer screening outreach campaigns have since been modeled after BHOP to provide education, screening and awareness programs in skin, prostate, colon, cervical and oral cancers. Sponsored by the Greater Knoxville Business Journal, the Health Care Heroes is an annual celebration of individuals and organizations that have made significant contributions to the quality and availability of medical care in East Tennessee. Leaders of five Knoxville-area hospitals worked together to select seven local heroes from hundreds of nominations. The leaders agreed that Dr. Bell's relentless efforts in cancer outreach paired with his individual care as a surgical oncologist and the advances he has made to change the culture on cancer awareness make Dr. Bell a 2014 Community Outreach Health Hero.